Bee-keeping for the production of honey and beeswax is one of the most ancient industries of which we have any record. It was carried out extensively in those parts of Asia, Africa, and Europe, bordering on the Eastern end of the Mediterranean Sea many hundreds of years before the Christian era, and was in a flourishing condition in Greece 600 years B.C., when Solon the great Athenian legislator, instituted laws regarding the keeping of bees. The esteem in which the chief product of the honey – bee was held in those days may be judged by its name being used in combination with that of milk, the most universal of all foods, to form the Oriental metaphor denoting abundance – a land flowing with milk and honey. In 1839 Miss Bumby, sister of an early missionary bought bees with her from England on the ship James. They were landed at Mangunga, Hokianga on March 13 on that year. The first Italian bees were landed in Auckland in 1880, and in 1883 a variety of bees including Italian were landed – Swiss Alpine, Holylanders, Cyprian, and Carniolian all of which were successfully established. Much has been written and discussed about Apiculture and its importance to the population at large, covering the – honey crop, bees wax and its uses, propolis – pollination etc. This most pernicious of bee diseases highly infectious to a bee colony is all too familiar to the majority of bee-keepers and without doubt – prior to the invasion of the varroa mite – was considered the greatest drawback to successful bee-culture. A killer by any standards and incurable. There are two forms of foul brood – American Foul Brood ( AFB ) and European foul brood. 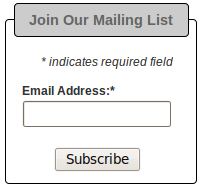 The later is not found in New Zealand. Another milder form of brood disease is known as Sac-brood. AFB is found in New Zealand, and can, and does cause considerable losses to the industry. From the early 1880s until near the close of 1907 New Zealand beekeepers suffered severely from disease among their bees, and believed the disease to be foul brood, but no one could say positively what it was or whether there was more than one disease present, or knew what treatment to follow. In order to set this matter at rest the chief government apiarist Mr. Isaac Hopkins in August 1907 obtained six typical specimens of diseased combs, three from each end of New Zealand and sent these to DR. E. F. Phillips in charge of Apiculture in the United States for examination and on the 23rd. 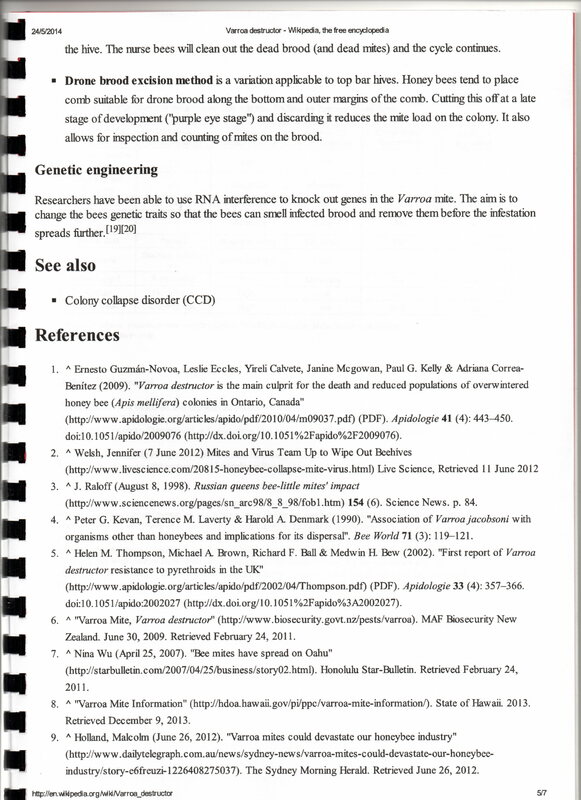 of the following November his report confirmed that American Foul Brood existed in New Zealand and it was caused by Bacillus larvae. but when attacked, which is usually about the time of capping – changes to a light buff, then to brown. It is however, when the brood has been capped that the average beekeeper is better able to detect the presence of the disease. In the early stages of the disease a capped cell at odd spots on the frame appears somewhat different from the surrounding healthy brood. Instead of the cappings being bright, full and of convex shape – characteristic of healthy brood, they are of a dull darker brown colour – flat or sunken, and often with small holes at the edge of the cell where the bees have looked to find out what is wrong. These signs indicate that the cell contains dead pupae. The disease will rapidly spread to surrounding cells and combs if allowed to take its course, and the colony succumbs. On opening the cells you will notice a thin glue like, pale coffee coloured mass, which on the insertion of a splinter of wood or match stick – and a small twirl – will adhere to the stick and can be drawn rope-like for some distance out of the cell. This is one of the most distinctive features of foul brood and where present is considered conclusive evidence of the disease. It is important when carrying out an inspection of a hive for foul brood that the bees are removed from the frame. This is best done by holding the frame by its lugs, and shaking the bees back into the hive, and ensure that all frames with brood are carefully inspected. Work the hive in an orderly fashion working from the bottom brood box upwards. It is important to ensure that the bees adhering to the frame you wish to examine are shaken down into the hive – into the cavity left by the frame you have removed to examine. This article is not intended to give a definitive coverage of the disease American Foul Brood, but as a guide to help new beekeepers better understand the dangers of the disease and the importance of regular checks – Autumn and Spring. For a fuller examination and understanding of AFB I would draw your attention to the book by Dr. Mark Goodwin “Elimination of American Foul Brood without the use of Drugs”. Should you be unfortunate enough to find AFB in your hive it must be reported to Assure Quality immediately? The bees must be killed. Frames burnt and any honey burnt with the frames placed in a well dug hole and buried. Other parts of the hive – base board, supers, hive mats, lids, other wooden items – may be saved by Wax dipping for 10 mins at 160 degrees. 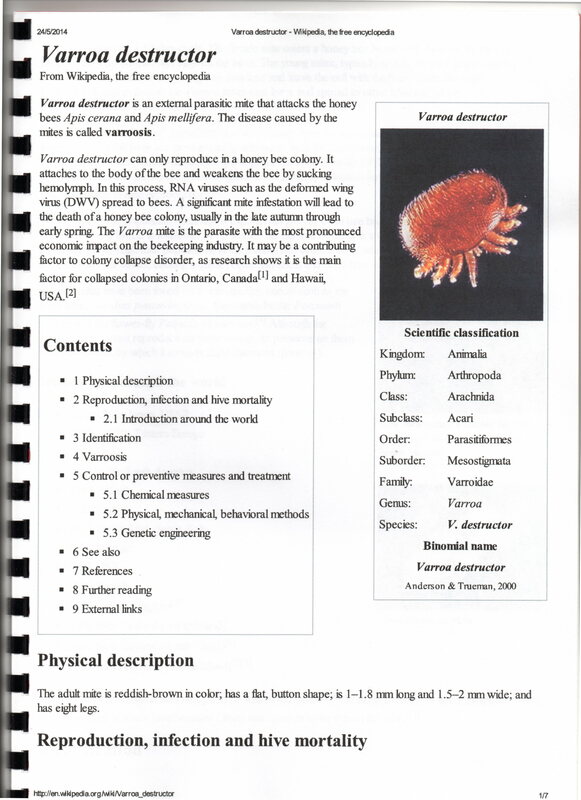 Varroa destructor: As an aid to new beekeepers and perhaps a refresher for the more experience the following article may be of interest. Whilst it not considered to be a definitive article it does provide some good basic information which if the reader so desires could help lead to further study. 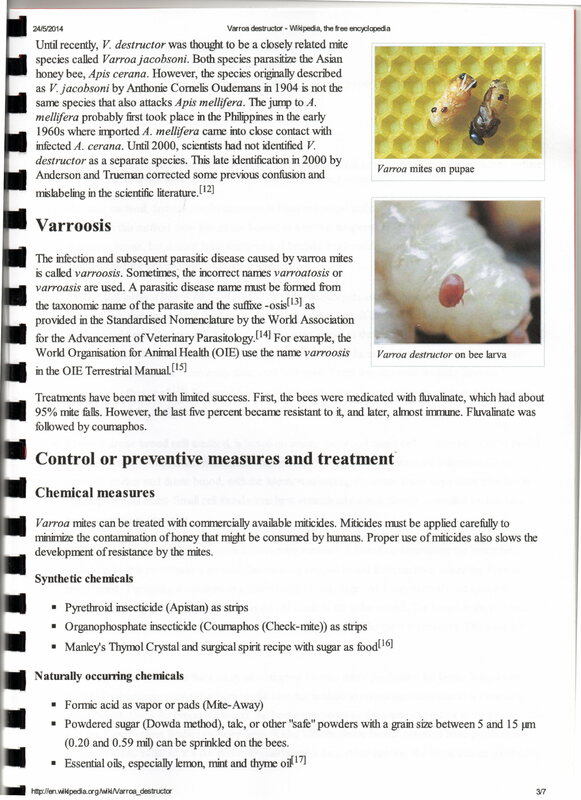 I would draw your attention to the excellent book “Control of Varroa” a guide for New Zealand Beekeepers, by Mark Goodwin and Michele Taylor. Click on the pages to read full size. The Wax Moths – Greater ( Galleria mellonella ) and Lesser – ( Archroia grisella ) are a serious pest of the beekeeping industry, causing damage to bee combs, comb honey, and other bee products. Neither are native to New Zealand, but were probably imported accidentally with bees or beehives. The distribution of wax moth species is controlled mainly by climate, with the greater wax moth causing serious damage in most of the North Island, and warmer parts of the South Island. The lesser wax moth appears more tolerance to cold and is found throughout New Zealand. The greater wax moth is by far the most destructive, but both species have similar habits, and the same methods are used to control them. The time the moths spend in the larvae stage varies considerably. In cold conditions or where there is a shortage of food it may be as long as six months, but in warmer climates, and abundant food, the larvae may become fully grown in as little as four weeks. In these conditions the damage to combs can be extensive. 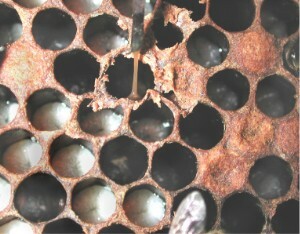 Wax moth can cause an infestation of comb honey. Seldom seen as a problem the comb can contain eggs and after packing when placed in a warm place these eggs can hatch and the larvae will damage the product. The best method is to freeze the comb honey and thus kill any wx moth eggs which might be present. After freezing if the honey not processed immediately the comb is best stored in moth proof stacks with newspaper between supers to prevent infestation. Large scale honey producers use commercial cool stores to freeze honey. Frames of honey stored at the end of season for bee feed next spring can be left on the hives until the first frosts before being stored. The only approved treatment for control of wax moth is freezing. The honey can be stored at room temperature after freezing provided supers are moth-proofed. Freezing also allows honey to be harvested earlier if varroa treatments need to be applied in the summer months. Pollen: Bee-collected pollen is very easily infested with wax moth and this often starts in the pollen trap before harvesting. To prevent moth damage, harvest pollen from the traps at least twice a week, then place in a freezer for 48 hours until needed. Pollen can also be fumigated with food grade carbon dioxide by putting it in a plastic bag and displacing the air with gas. 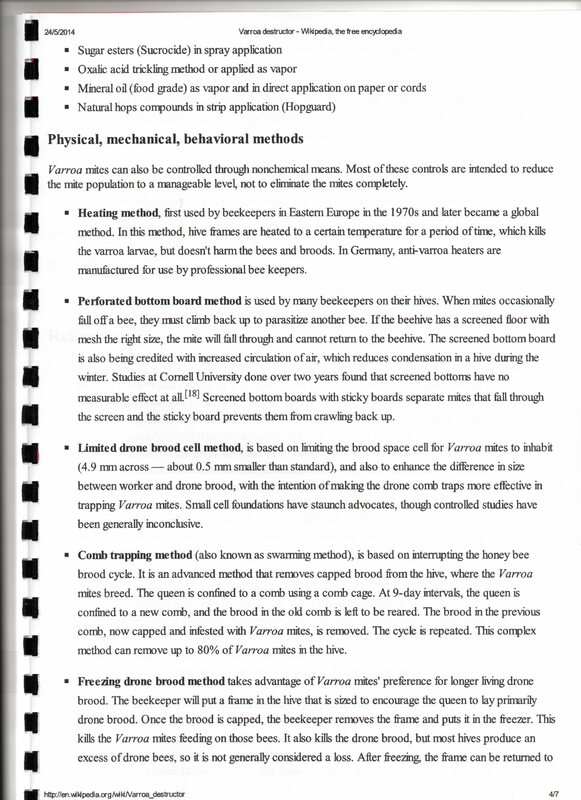 I would suggest that people buy the excellent book – Practical Beekeeping in New Zealand.